Ria Loves Pawlish: OPI Red Lights Ahead... Where? went on a little road trip today to see my friend again before she heads back to Germany. when she moves back to the US we'll be living on opposite coasts... so, i have no idea when we'll see each other again, major bums on that for sure!! 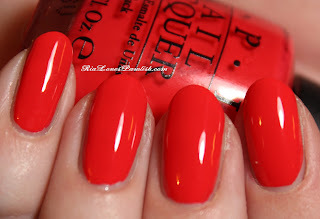 today we're looking at the red polish from the 2012 OPI Holland collection, Red Lights Ahead... Where?. i have to say i hate the name of this one but i LOVE its color! it is similar to OPI Monsooner Or Later, but more cool toned and with a jelly cream finish as opposed to MOL's straight up cream. it's so fun and bright, the color reminds me of ripe tomatoes... but super shiny! polish just can't be too shiny for me and this dries super shiny and with the Seche Vite topcoat it truly has that vinyl shine... dreamy :) the formula is thick but so easy to work with, two thick coats = perfect. using Seche Base as your foundation (it dries with a slight white tint) makes it much easier to reach full opacity with any polish! one coat Seche Base, two coats FLAW? (it totally amuses me that it spells flaw! ), and one coat Seche Vite. as always, the polish color changes in different lighting, this was taken under an OTT light... which is supposed to show true colors... the swatchie looks totally different when i have my laptop actually on my lap than when it's in front of me, the truest color for most lighting is when the laptop is at eye level!